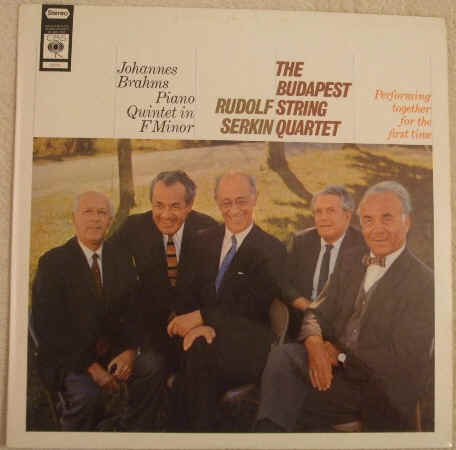 33rpm LP Record of CBS 72273 BRAHMS PIANO QUINTET in F minor, featuring Rudolf Serkin on Piano, with the Budapest String Quartet (Joseph Roisman and Alexander Schneider, Violins; Boris Kroyt, Viola; Mischa Schneider, Cello) performing together for the first time. It was issued on the stereo blue CBS label. UK pressing. The record itself is graded excellent, with no visible surface marks or scratches when viewed under normal house lighting. Excellent sound quality, with NO jumps, pops or ticks and just a little light crackle at the start of Side One. Otherwise more or less faultless playback. Minimal to no spindle wear. Labels have light spotting/blotching marks. No discernible spider marks. The outer sleeve and original inner sleeve are also graded excellent, with no major signs of wear.